Annet Gelink Gallery proudly presents its third solo exhibition of Yael Bartana "If you want, we'll travel to the moon together". The title is a revealing quote from Mary Koszmary (2007), of which the central work of the exhibition, Mur i Wieża, is the long-awaited successor. This exhibition features the premiere of Mur i Wieża (2009) in the Netherlands. Mur i Wieża (Wall and Tower) elaborates on the first part of the trilogy, Mary Koszmary (2007). In Mary Koszmary (Nightmares) Polish left activist Sławomir Sierakowski (1979) incites in a compelling monologue in an empty stadium in Warsaw 3 million Jews to return to Poland. With in the background the motto '3.300.000 Jews can change the life of 40.000.000 Poles', the works touches upon one of the most essential questions of Polish history - the disastrous results of the Holocaust for Polish society. Mur i Wieża answers the call of Sierakowski. In the same propagandist style the film shows how a group of young traditionally dressed Jewish pioneers return to Warsaw. At the spot where in World War II the Warsaw Ghetto was located, and beside the impressive 'Heroes of the Ghetto' Monument, the cheerfully young people are building a new settlement reminding one of the settlements founded by Jewish colonists in the thirties on Palestinian soil. Yael Bartana hints at the Zionist dream, with heroic images of strong, beautiful men and women building their new country undisturbed by difficult conditions. 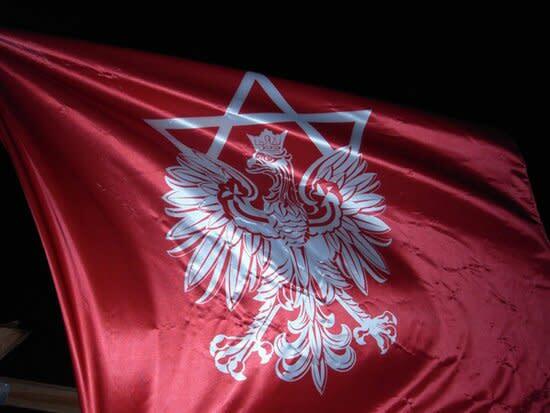 At the watchtower a blood-red flag with a new symbol has been raised - the Star of David combined with the Polish eagle. Approvingly watched by Sławomir Sierakowski, but simultaneously inquiringly looked upon by Polish passers-by. With this work Yael Bartana rewinds history in a playful manner, strengthened again by the soundtrack. The film is supported by the Polish anthem Mazurek Dąbrowskiego, followed by the Israeli anthem Hatikva, played backwards. Mur i Wieża cleverly balances on a fine line between fact and fiction. It encourages everyone to critically scrutinize his or her own constructed ideas about migrations and religious-cultural conflicts.